Mary Bonner – Three Bucking Broncos. Hand colored etching, 6 x 10 inches, signed l.r. 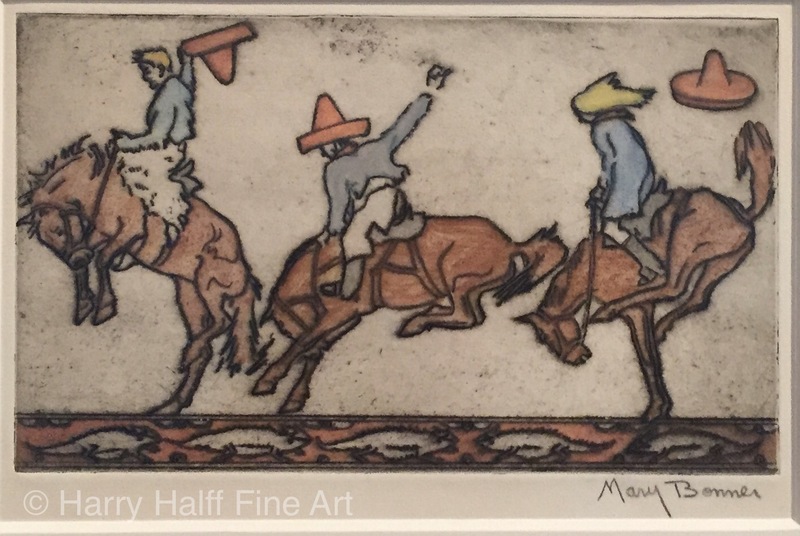 Mary Bonner (1887-1935) is the best-known Early Texas printmaker, and one of the few Texans who received recognition in Europe. Bonner’s interpretations of Texas cowboys inspired by Greek friezes, and her sense of whimsy, remain her most popular subjects. The gallery has handled almost all of her images, from the Breton subjects to the Cowboy triptychs. Located in San Antonio, Texas, the gallery has been dealing in fine art for over 30 years. Buying and selling 19th century American paintings with an emphasis on Early Texas Art is what we specialize in. We purchase and sell paintings by Julian Onderdonk, Robert Onderdonk, Jose Arpa, Theodore Gentilz, Hermann Lungkwitz, Mary Bonner, Thomas Allen Julius Stockfletch and other pre-1930 artists working in Texas.